August 30, 2015. So Matthew and I had our first chance to experience an official hytte vacation like real Norwegians. Granted, our hytte — which usually connotes a remote mountain cabin — was only an hour outside Oslo by bus, and located not far away from a rural subdivision, but I’m still claiming that it counts. After all, we had to “do our business” in an outhouse, draw our water from a nearby stream, burn candles for light at night, heat the place via a wood-burning stove, and cook our meals over a fire and a two-burner propane hot plate. 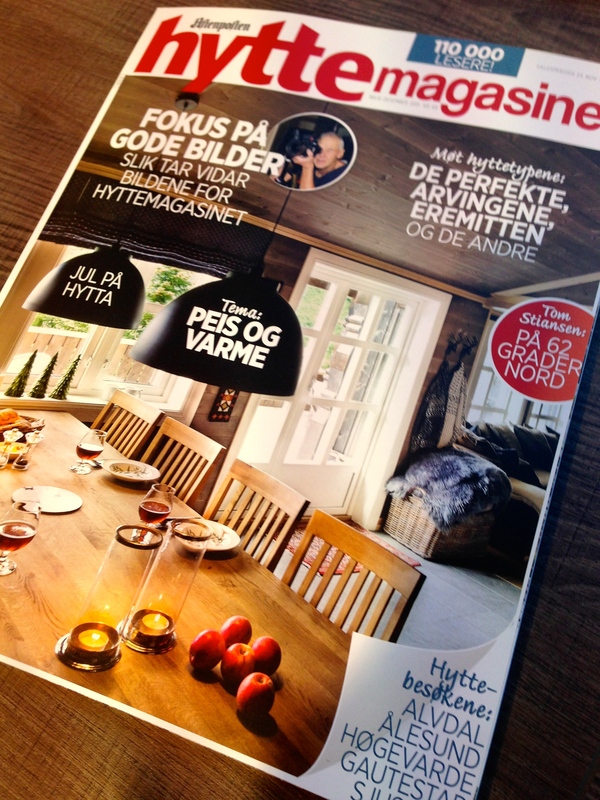 Several Norwegian design magazines are devoted to helping folks bling out their hyttes. As most any Norwegian will tell you, those five ingredients are essential for a cabin to be considered a true hytte (which literally translates as “hut.”) In reality, many Norwegians spend thousands of dollars pimping out their hyttes so that they resemble rustic shacks on the outside, but Architectural Digest-worthy mountain resorts on the inside, complete with designer furniture, fabrics, and décor. 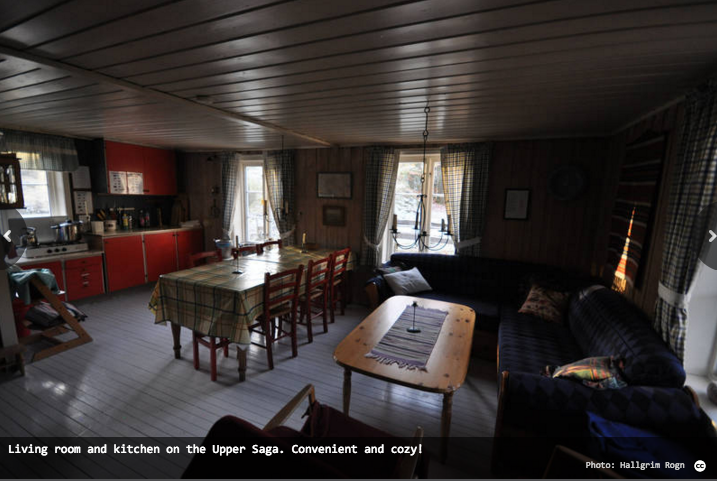 Our own hytte came from the collection of more than 500 rental cabins available through the Norwegian Trekking Association (Den Norske Turistforening, or DNT for short). A DNT membership (around $115 per couple) gives you the key to the front door of quaint little cabins scattered all over Norway — no lie, the same key opens every door. All you have to do is reserve your cabin, pay a nominal fee (the cost for our group of six was about $150 for two nights), chop wood to replace what you use, and tidy up when you’re done. Our hytte weekend began on Friday night after work. Two other couples from our job site rented a car to carry everyone’s provisions, plus their baby gear. Matthew and I, however, elected to take the bus and then hike the rest of the way from the main road. In reality, we left work so late that, already exhausted and not wishing to undertake a three-hour hike in complete darkness, we wimped out and took a taxi as close as we could get to the cabin. 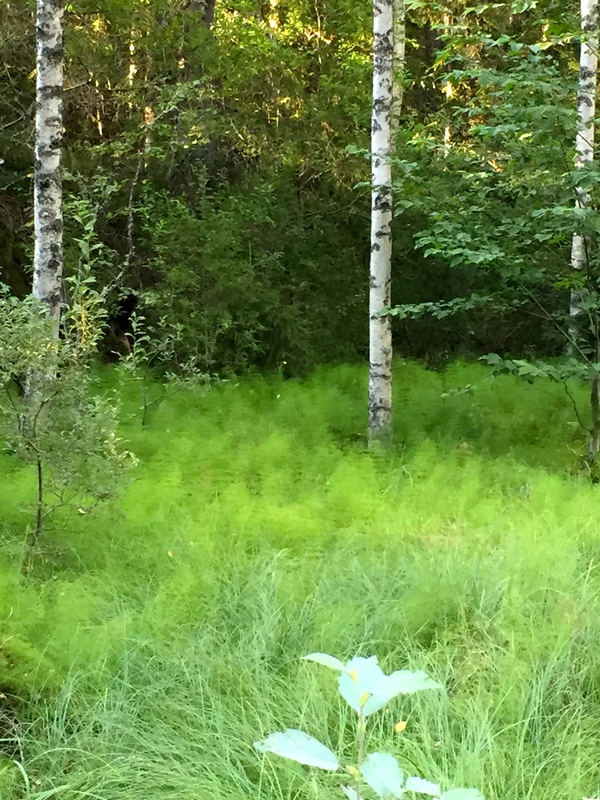 Before the light completely faded, we spied some gorgeous little wetland areas knee-deep in horsetail and ferns. The cab ride itself proved to be an adventure, as Google maps didn’t acknowledge the small rural roads we needed to take. Our driver, who spoke little English, was so frustrated with our crappy navigation using old-school paper maps that I think we were a hair’s breadth from being dumped on the roadside. Finally we spotted a wooden DNT sign pointing to “Øversaga” (our cabin’s name — they all have names), so we jumped out, strapped on our packs and headlamps, and took off down the darkening trail. An hour later, hopelessly lost, we admitted defeat, backtracked to the dirt road, and followed it for another hour to the cabin. Our timing was impeccable, though, as we showed up just as our travel companions pulled the ribs off the fire. We quickly parked ourselves on the picnic bench and dined in style by candlelight, enjoying some fabulous dishes prepared by the actual chef in our group. It’s amazing the delicacies that can be cooked up over an open flame. We split our large group between two canoes. That said, we were still “low riders” in the water. After a night that included drinking several bottles of wine and playing Cards Against Humanity, we hit the hay and slept soundly, to say the least. Next morning, we whipped up some omelets for breakfast and packed our lunches for a day of canoeing to the various tiny islands dotting the nearby lake. 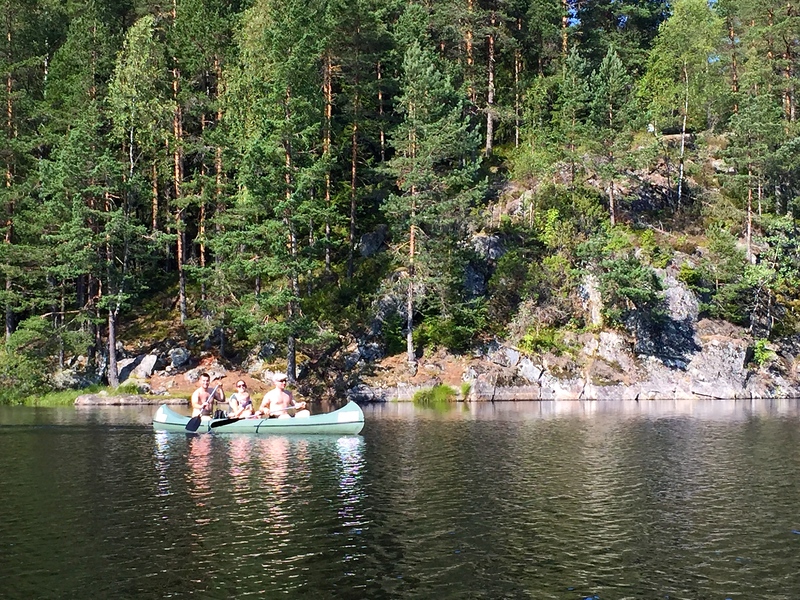 Paddling on perfectly calm waters proved to be wonderfully easy, except for the occasional challenge presented by huge glacial rocks that suddenly loomed up from the bottom of the lake. Sighting these behemoths lurking mere inches under the surface sent us all scrambling for deeper water to avoid being overturned. Our next hurdle was selecting which of the many picturesque islands would become our picnic spot. Several were no more than a tiny outcropping of rock, while others were large enough to host a campsite. No matter the size, most bristled with sculptural, twisted pines that looked like perfectly groomed Bonsai displays, lovingly tended by master gardeners. A liberal sprinkling of pink and white heather dusted the shores of many islets, giving them a hazy appearance so that they resembled mirages shimmering in the slanting, late-summer sunlight. Note the soft pink and purple heather along the shoreline. Beautiful reflections on the calm lake. Bigger islets made for picnicking. After scouting out a few contenders, we finally selected an island with a promising ledge for cliff-jumping. First order of business: testing the waters. Glacially cold, as expected. The men all flaunted their hutzpah by cannon-balling, but the women gave up after a few attempts to wade further than knee-deep. We females didn’t relish the idea of shivering over our sandwiches, so we contented ourselves with filming the guys in slo-mo as they hurled themselves off the precipice. 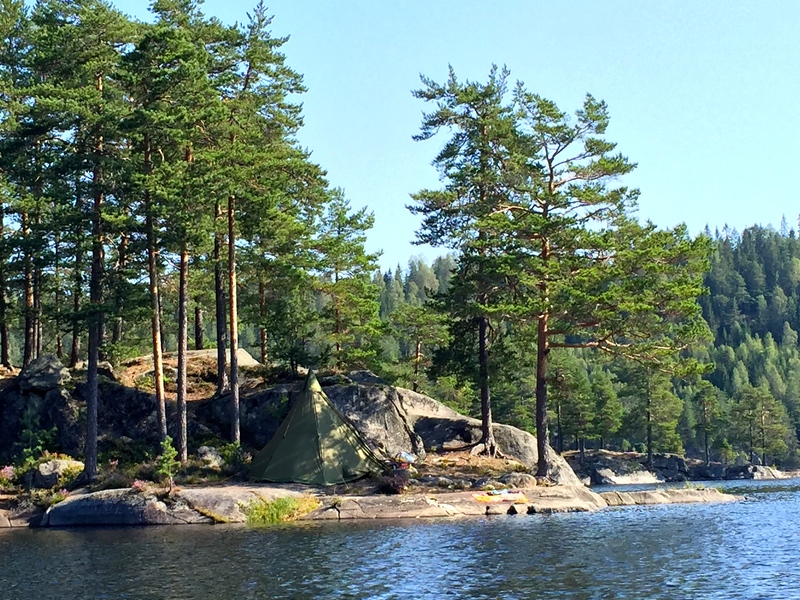 After lunch, we wandered over the little island and discovered a DNT tent campsite that came with its own pit toilet. Logs nailed to the base of four trees provided a framework over which plastic had been draped. From what I gathered, users were supposed to squat over the plastic, then cover their deposits with pine needles. Several nearby bundles of plastic buzzing with hordes of flies testified to the popularity of the spot, and I wondered when the poor DNT volunteers would eventually cart off the smelly loot via canoe (supposedly motorboats aren’t allowed on the lake.) Talk about your garbage barges. DNT rents this sami-styled lavvu (tent) that comes with a pit toilet. My advice: go early in summer before the stench builds. Blueberry bushes make up much of the undergrowth in Norwegian forests. A cool caterpillar enjoys the blueberry bushes as much as we do. Related to the “Destroying Angel” mushroom, this toxic and hallucinogenic Amanita muscaria is found around birches and pines. For some odd reason, it’s especially popular to use in Christmas displays — maybe because of its festive color? The best blueberry picker in the bunch. We eventually headed back to our hytte, only to discover that a horde of campers had descended during our absence. Two fathers wishing to give their wives a rest from childcare had taken their three boys for a weekend of camping and had pitched their tent next to the firepit. And in the grassy spot beneath our living room window, three moms and their nine children had a erected a tent village. DNT rules and Norwegian custom discourage turning anyone away from a site, so we experienced a rather bizarre evening of little kids creeping up to peek in our windows, eavesdrop on our English conversations, and witness how The Americans enjoyed a Norwegian hytte. We did feel rather sorry for everyone when scores of mosquitoes descended on the site at nightfall. We’d tacked up netting over a couple of our windows to prevent the bugs from getting in, but our fellow campers had to don beekeeper hats and gloves, along with gallons of bug spray, to avoid donating to the insect blood bank. By the way, in case you didn’t catch the reference, Norwegians never use window screens. When I’ve asked about it, they claim there’s no need because there are no bugs in Norway. 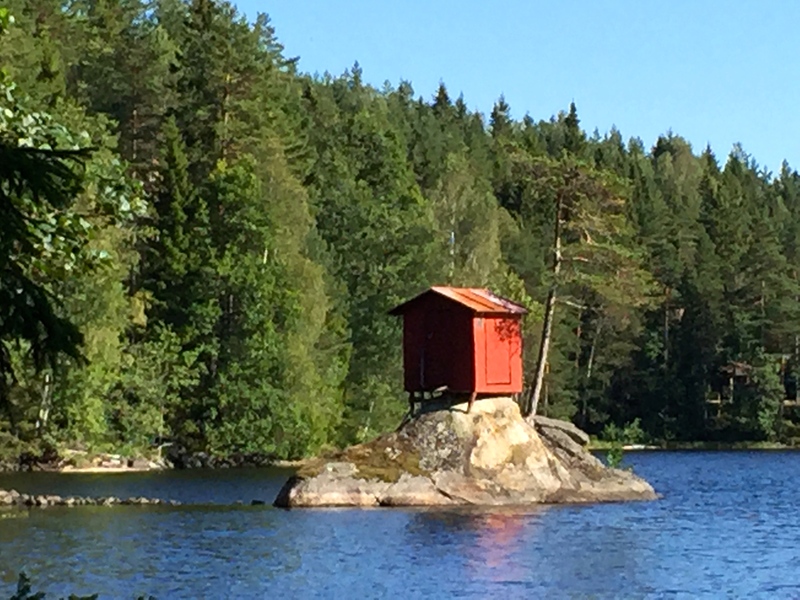 I’m not sure if this is an outhouse, or just a hermit hytte for a person who really enjoys his privacy. Anyway, I digress. Back to our hytte experience. The next morning, we made blueberry polenta slop for breakfast with our stash from the day before, then we went to the river for dishwashing water. Norwegians claim that the water is so clean, there’s no reason to boil it. And unlike American beavers, Norwegian ones don’t carry giardia. But frankly, after witnessing the number of outhouses clustering around the lake, it’s not the woodland critters I’m worried about. Hence, we boiled the tea-colored liquid — liberally populated with bits of unidentified flotsam — for twenty minutes just to be safe. 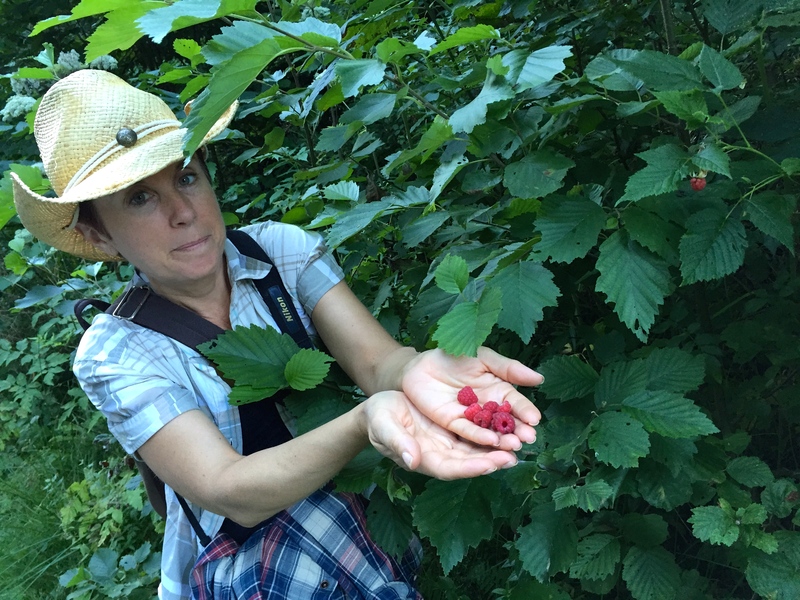 On our hike home, we also collected tons of perfectly ripened raspberries. In this photo, I’m trying desperately not to inhale the clouds of mosquitoes hovering around my head. After cleaning up our dishes, mopping up the floors, depositing our leftover dry goods in the cabinets for future campers, and dragging the canoes up from the lakeside, we headed for home. Matthew and I hiked the five miles to the bus stop, where we arrived back in Oslo within about 40 minutes. That’s one of the amazing things about this city, in just a short time, you can be out in the gorgeous countryside. Since winter is not far away, we’re hoping to cross-country ski to our next hytte, so stay tuned…. A view from our island. Enjoying the last of the summer sun.